ATTENTION! There are two different Ethernet magnetics arrangements: one for original EM1000-...- 00, another one -- for the EM1000-...- 01. •Do not combine AVCC with the VCC (main power) pin. 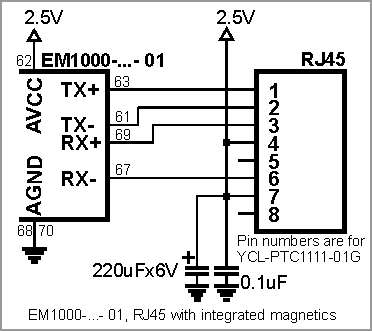 On the EM1000-...- 00 this is counter-productive, and on the EM1000-...- 01 this will apply wrong voltage to the AVCC pin. Doing so appears to be causing no immediate permanent damage to the EM1000-...- 01, but the circuit will not work and the effects of prolonged over-voltage on the AVCC line are not known. You can use either a standalone magnetics part (such as YCL-PH163112) or RJ45 connector with integrated magnetics (i.e. YCL-PTC1111-01G). Here are two connection diagrams based on the YCL-PTC1111-01G -- one for the EM1000-...- 00, another one - for the EM1000-...- 01. •Do not install four 50 Ohm resistors (they are crossed out on the diagram). •Connect a wire between pins 4 and 7 of the RJ45 connector (pin numbers are for YCL-PTC1111-01G). •If possible, find a way to install a 220uF capacitor. The circuit will still work even if you don't have this capacitor but you may have FCC/CE certification issues. •Notice that one of the 0.1 capacitors becomes redundant but that's OK.
•All of the above is based on the assumption that your host PCB was designed correctly and the AVCC output of the EM1000 is not joined together with the main VCC line. 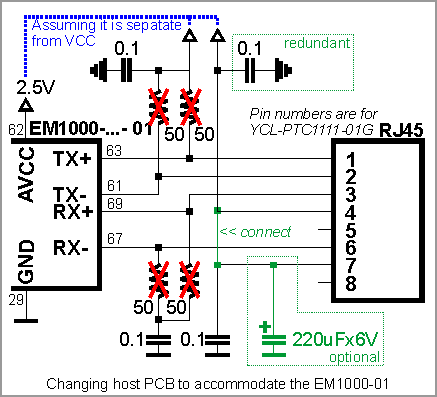 If you erroneously had AVCC and VCC combined together then you will need to separate them as well: pin AVCC outputs 2.5V on the EM1000-...- 01 and this is different from the main power on the VCC pin, which is 3.3V. 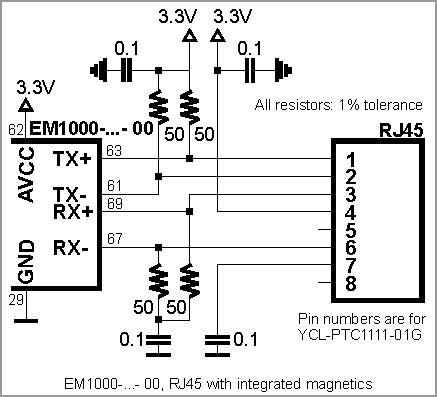 Applying 3.3V to pin AVCC of the EM1000-...- 01 appears to be causing no immediate permanent damage to the device, but the circuit will not work and the effects of prolonged over-voltage on the AVCC line are not known. It is important to make the PCB wire connections between the Ethernet port pins of the EM1000 and external magnetics circuitry as short as possible. Making the wires too long may cause the noise level generated by your PCB to surpass the maximum radiated emission limits stipulated by FCC/CE regulations. Additionally, longer Ethernet lines on the PCB will make your board more susceptible to the damage from the ESD (electrostatic discharge). The EM1000 also has two Ethernet status LED control lines- see here for details.